Luxury vinyl flooring and laminate flooring are often compared when it comes to flooring because they share some similarities. They are both similar in terms of cost and durability and they’re both just as easy to maintain. If you are thinking about choosing between luxury vinyl floor tiles and laminate flooring there are some differences to consider. In this post we’re going to explore the pros and cons of luxury vinyl vs laminate flooring. Luxury vinyl tiles (or LVT) are versatile, durable and come in many different designs. They come in both stick-down and click varieties, meaning LVTs can be used by both professionals and DIYers alike. Some examples of luxury vinyl tile manufacturers include Karndean, Quick Step, LG Hausys Coretec and Adore. 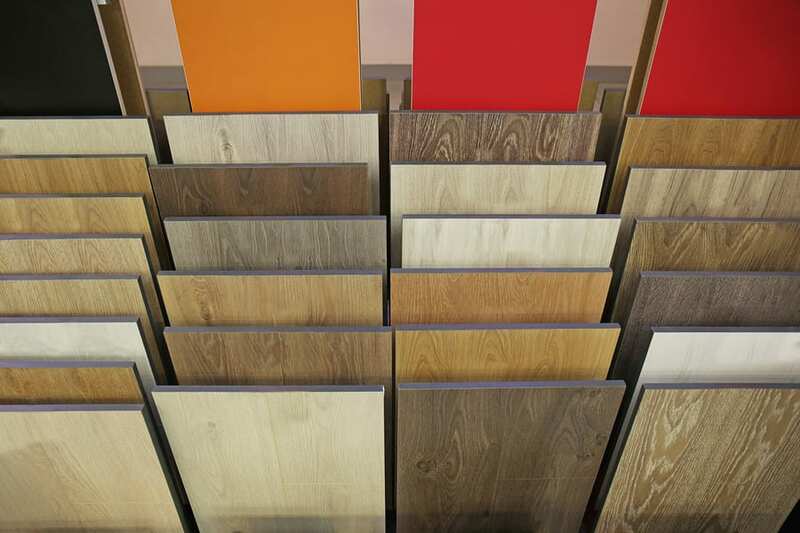 LVT is a heavy duty vinyl, meaning it’s immune to major issues that are caused by water and moistures. The tiles are also incredibly easy to clean and can be glued down. It’s cost-effective, durable and can imitate virtually any natural surface such as wood or stone. LVT makes the perfect material for bathrooms thanks to its water resistance and a wide range of designs. Since it’s resistant to water, it’s fairly easy to clean spills and keep your LVT flooring well maintained. Luxury vinyl flooring can be difficult to install correctly without some experience or a professional. For DIYers, this can be off-putting. LVT has a disadvantage in that it can become discoloured if it is in constant exposure to direct sunlight. Therefore it is not a good option for outdoor use. Another disadvantage is that LVT is not biodegradable which is sometimes important for prospective buyers. Laminate flooring is easy to install and is stylish, hard wearing and looks fantastic. It’s the go-to choice for most modern family homes and features a range of stylish finishes. Two examples of laminate flooring brands include Quick Step and Lifestyle Floors. Laminate flooring does a great job of replicating hardwood flooring, giving it a fantastic look and feel especially because it’s made primarily from wood. Much like LVT, laminate flooring is durable and affordable. It’s also easier to install, making it perfect for DIY enthusiasts to install their own laminate flooring. Laminate flooring is incredibly easy to clean and there are virtually no defects unless you purposely damage it. It’s also resistant to dents and staining. Sadly, laminate flooring isn’t good with high humidity and moisture. You’re going to need to control the humidity in the room so that the laminate doesn’t squeak or warp. Water can often cause permanent damage to laminate flooring too, so be careful where you use it. While it’s an affordable alternative to hardwood, it’s nowhere near the real thing in terms of quality. Hopefully, this brief article has given you some idea about the differences between luxury vinyl vs laminate flooring. In terms of cost, they are both relatively even and easy to install. They both have their uses and it mainly comes down to what room you plan to use them in and the styles you want to convey.